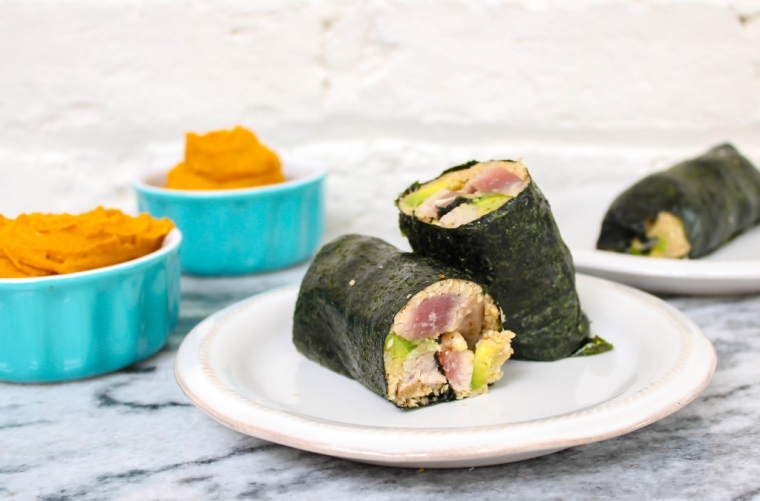 Nori offers an excellent gluten-free option if you’re a wrap lover. It’s packed with vitamins and minerals and a great source of iodine, which supports thyroid health. Heat a small skillet over medium-high heat. Season both sides of tuna with sea salt and black pepper. Coat with ghee or cooking oil and sear 2-3 minutes per side. Set aside. Heat a medium skillet over medium-high heat. Add olive oil and ginger and sauté 2 minutes. Add cauli rice, coconut aminos, rice vinegar, and sesame oil. Stir until rice is coated through and cook 5-7 minutes. Remove from heat and set aside. Place everything in a high-speed blender until creamy. Spread cooked cauliflower rice evenly among two sheets of nori. Thinly slice avocado and put atop cauli rice. Add thinly sliced tuna. Fold 2 of the sides in about an inch and roll. Enjoy with dipping sauce!